Eternal Mangekyou Sharingan, is 5000 words. deduct your eye's life span. left until I went blind, etc. Once you get Eternal Mangekyou Sharingan, you DON'T HAVE TO WORRY ABOUT GOING BLIND! Hence, the word, Eternal. Before you continue reading, do you have S rank? Because that's what you need to use these. Register Space Time Jutsu using the Jutsu Template. You can only use Space Time Ninjutsu 5 times per fight, hopefully you don't even get to that limit, but hey, some people. More Information will be added as we go on! If you want the Rinnegan, you must have gained Senju DNA in through a Role Playing Topic. To gain Senju DNA, you cannot get it from an NPC, you have to get it from a real player! If you start as a Senju, you must gain a Uchiha's eye, and this can be done from an NPC. If you in fact, gain an Uchiha's eye, the highest level it can start at is Stage/Tomoe 3. 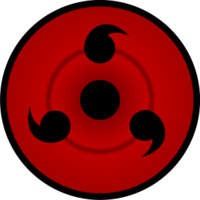 The Uchiha's eye must also be Stage/Tomoe 5, which is Eternal Mangekyou Sharingan, before you unlock the Rinnegan. The approval of obtaining the Rinnegan has to be passed through at least 2 Moderators or Admins. More Information will be added as we continue!